Floyd Bennett Field is a unit of Gateway National Recreation Area. Located in Brooklyn across Jamaica Bay from J.F. Kennedy Intl Airport. Veterans, aviation enthusiasts, historians, preservationists, local-state-federal public officials, non-profits, and friends of Gateway National Recreation Area. Dedicated to preserving and teaching the military aviation heritage of Brooklyn's Floyd Bennett Field and linking the Field to WW2 home front sites on Long Island and elsewhere. When Gateway National Recreation Area was established in 1972, World War Two was still considered "recent history" and the divisive Vietnam conflict was still raging. There was little thought or public interest in telling the story of the Field's role on the WW2 home front. As a consequence, the Field's enabling legislation, planning, and subsequent nomination to the National Register of Historic Places did not account for the Field's WW2 story, and hastened demolition of historic WW2 naval buildings and structures. Leading historians agree that Floyd Bennett Field, as Naval Air Station New York, played a critical role in support of our victory in WW2. 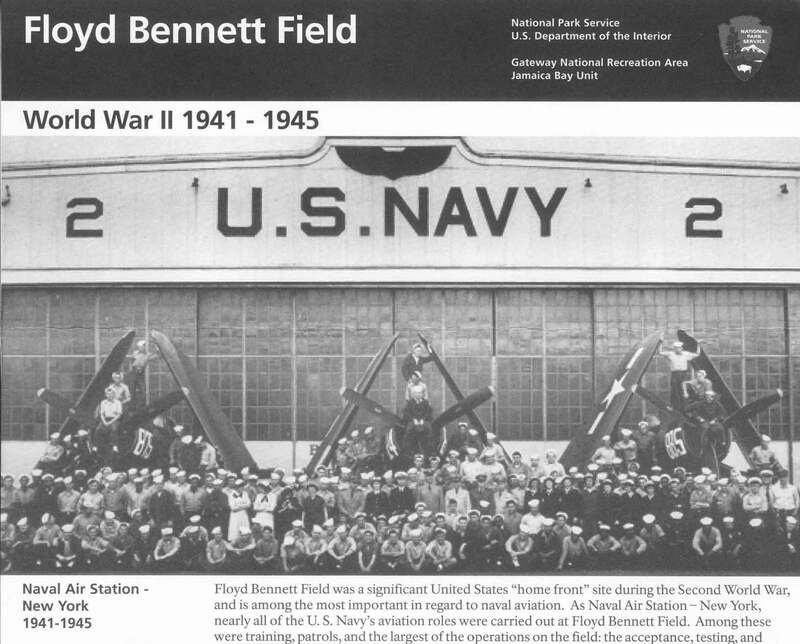 The Field was headquarters for the commissioning and deployment of the Navy's aircraft. It was the center for military helicopter development and served as the first helicopter training facility for allied pilots. The Navy artfully adapted the Field's civilian art deco style control tower and permanent hangars to military use, and built their own buildings and structures in a more functional style of military architecture. Floyd Bennett Field was at the center of the nation's most stunning industrial transformation: the WW2 mobilization of automobile and "job-shop" aircraft plants to mass producing hundreds of models of quality military aircraft. The Field was the hub for deploying nearly 100,000 Navy aircraft from manufacturing centers in the greater New York area, southern California, Ohio, Kansas and Texas. This remarkable feat was accomplished before management consultants, modern methods of TQM and Just-In-Time, computers, composite materials, and satellite navigation. Newly minted engineers, riveters and pilots came together - quickly and gladly - to design, build, test and deliver the world's largest fleet of airplanes. The Field was a base for naval aviation reserve squadrons in the 1930's, and from 1946 to 1972 - through the Cold War and conflicts in Korea and Vietnam. In recent years, public consciousness has been rapidly growing of the historical importance of Americans' contribution to victory on the home front. Our nation's recent focus on homeland security has made this story even more relevant. As a result, Gateway has responded and begun to incorporate this story - or "historical theme" - into its programs. But there is much more to be done. We are also working to link Floyd Bennett Field's story to sites on Long Island - the "cradle of aviation" - and others around the country, such as Rosie the Riveter/WW2 Home Front National Historical Park in Richmond, California. Collectively, all of these sites tell the complex and compelling story of the WW2 home front. Our purpose as a task force is not to create another organization but to serve as a catalyst for action. This web site presents a brief history of the Field during the 30 years it served as a Naval Air Station - N.A.S. New York - from 1941-1972, along with our activities and suggestions for how you can help preserve the Field's heritage. We are updating and adding to the site regularly. We're volunteers with day jobs, so we'd appreciate your help, comments and suggestions. Thanks for visiting. We look forward to hearing from you! 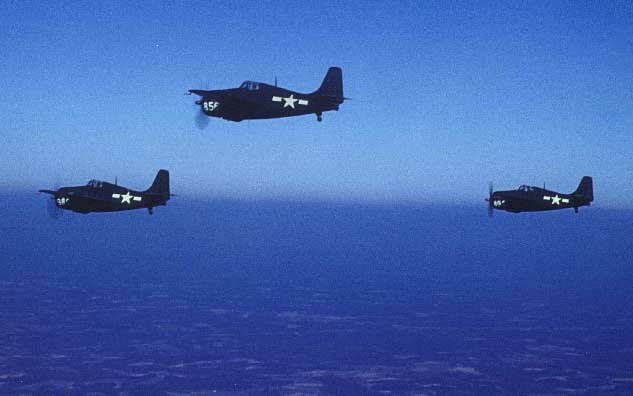 WW2 Naval Air Ferry Command in action ... flight of new FM-2 Wildcat fighters over El Paso Texas, en route on ferry flight from Floyd Bennett Field (NAS New York) to NAS San Diego (North Island), 1944. These Grumman designed planes were built by General Motors Eastern Aircraft Division in Linden, New Jersey. Photo by VRF-1 pilot Lt.(jg) C.G. Bateson. 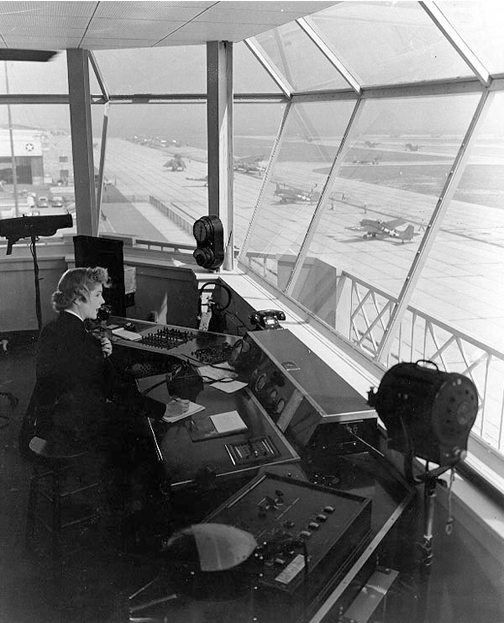 (Above) WAVE at work in Floyd Bennett Field's control tower, November 1943. Note the FM and TBM airplanes on the tarmac. U.S. Navy/National Archives photo. Commute, NAS New York style, 1944. Navy personnel wait for a bus, or a rideshare from Brooklyn residents, to get to the subway or other destination. In front of what is now the Ryan Visitor Center on Flatbush Avenue (former control tower administration building). US Navy photo.